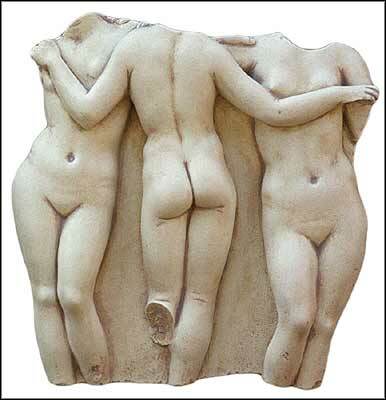 The Three Graces, Three Graces, Greek Art. The Louvre Museum, Paris. 100 B.C. They are the beautiful sister Goddesses who attended Aphrodity, the Goddess of love, and were personifications of grace and beauty. They spread the joy of nature and lived on Olimpus. Their names, number and parentage vary, but they are generally said to be three sisters named Euphrosyne, who represented jollity, Thalia identified with abundance, and Aglaea, a representation of splendor. They are daughters of Zeus and Eurynome or Hera. They influenced artists throughout the ages. They were depicted in sculpture and vase paintings by the ancient Greeks, in Roman wall paintings at Pompeii, in Botticelli's allegorical painting known as Springtime, and in a marble statue carved by Canova. In art they are frequently represented as naked girls with their hands on each other's shoulders, the two outer figures looking one way and the middle one looking the other.